Most vehicle engines are controlled by an on-board computer called the engine control unit (ECU). This unit controls functions such as ignition timing, fuelling and boost pressure for all vehicle engine speeds and loads. With ECU tuning and remapping we can test the way your engine is controlled so that it gives better performance and greater fuel economy. When cars are manufactured the ECU is set to the country that it is going to be sold in. This means the intended performance can be compromised to take account of environmental factors such as climate, fuel quality and emission laws. ECU tuning and remapping will optimise these parameters so that you get the performance from your vehicle. This means you could potentially benefit from as much as 35% more power, 35% more torque, better driveability, a quieter, smoother and more responsive drive as well as up to 15% fuel saving. At Cross Motor Engineering we deliver an ECU tuning process that is tailored to your vehicle, whether it’s petrol or diesel. With more than 30 years of experience in the car tuning industry we have kept pace with all the latest processes and technology and we know what it takes to ECU tune your vehicle so that you enjoy the best performance. We will analyse the optimised settings for the make and model of your vehicle and make sure that when your vehicle is tuned, that you benefit from all the improved performance measures that your vehicle was always intended to deliver. We will guarantee to boost your fuel efficiency, get you more miles per gallon, plus a better overall performance. 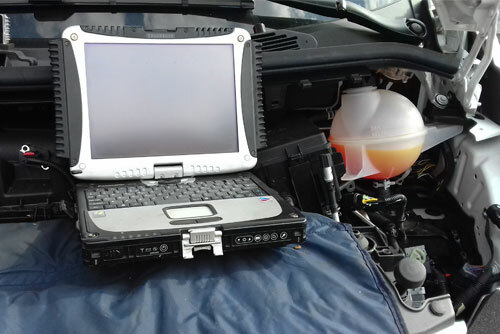 Areas such as engine temperature, accelerator pedal angle, oxygen content in burnt exhaust gases, fuel economy and torque ability will all be thoroughly analysed and by re-configuring the ECU unit we can make sure that your vehicle gets the right quantity of fuel at the right time, so that the performance and overall economy is as good as it can be. We offer an extensive ECU tuning service which analyses and retune areas such as fuel pressure, throttle pedal control and ignition advance so that you can get the best performance from your engine. This will improve the power, increase its torque and also reduce the amount of fuel you use. At Cross Motor Engineering we provide ECU tuning for all makes and models of car, from family cars, MPVs and 4WDs to commercial vehicles. We will enable you to achieve greater fuel efficiency, extend the lifecycle of your car and give your vehicle better performance, with significant savings gained in the long run. We offer ECU tuning and ECU remapping for a wide variety of prestige vehicles including Audi Tuning, BMW Tuning, Mercedes, Landrover and many more. If you’re looking to get the most out of your vehicle’s performance and want to know more about ECU tuning and how you can benefit, then please get in touch and speak to one of our specialist team. We would be more than happy to help.